When it comes to business valuation appraisal, every company has their own method of calculating business worth. But have you ever wondered how, exactly, to value a company? Regardless of how much money one has put into renovating their business space, how many assets they have, what their inventory looks like, or how much revenue they’ve raked in last fiscal year, it is a culmination of all of these things that determine a company’s value. So what business valuation appraisal methods are most common? One of the simplest ways to value a business is to add up all of the assets and subtract any pending debts. Of course, this is easier said than done. Hard assets like equipment needed to do the job are not going to be worth nearly as much as they were when they were first invested in. In order to calculate the value of these assets, you’ll need to estimate their resale value, not the amount that was paid for them. This valuation calculation method most often turns out on the lower end, since it does not consider the industry or market that the business is in. In other words, it leaves out what may be most compelling to a potential buyer. Any potential buyer is interested to see the potential of a company and will want to see that the company will continually produce profits. To value a company’s future profits, it’s important to look back on past financial documents. Has the company been growing at a steady rate? Is the income predictable? While a company may have had a great quarter, that does not always equate to high value. Flukes happen and buyers are more interested in consistency than huge profit surges. The “discount rate” is determined by the buyer and considers the monetary value of the time it will take to make up their investment. How much money will it cost the buyer to both acquire and reevaluate the company to their liking? This time is made up for in the discount rate. 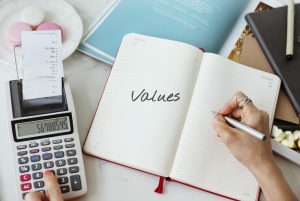 Comparable business valuation appraisals consider the market that their industry is currently a part of and whether their business is sustainable. If they are a lone wolf in the industry, that could be good or bad. While buyers applaud pioneers in their field if they are successful, many companies without competitors do not have any because the business model simply does not make sense. If they do have competitors, a buyer will likely look at the value of similar businesses that have sold in order to make a comparable offer. Of course, none of these methods are cut and dry. A proper small business valuation appraisal is based on two things: circumstance and monetary value. In this case, it is important to take all three of these techniques into account. Banker Valuation’s business valuation software provides highly accurate valuations based on a culmination of all of these factors, including the current business market. This tool makes the job of a banker much easier and will benefit the client/business owner with a highly specific and in-depth valuation.